Mickey Collins during his Portadown career. Mickey Collins is back in Portadown! The former Irish League midfielder - considered one of the greatest to pull on a Portadown jersey - has signed to play next season with Rectory Rangers. Rangers manager Tony Bell is relishing the positive impact Collins can have on his Mid-Ulster League Division Two squad. “He had been playing a bit last season around Belfast but works with quite a few of the Rectory lads for David Jameson,” said Bell. “He was down watching us last weekend in Brownstown Park for our friendly with Ballymacash Rangers, got chatting and signed for us this week. “Mickey is keen to play at the back and enjoy his football, rather than midfield. “He can sit and direct everything from the defence. 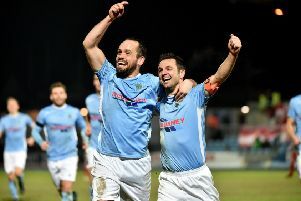 Collins, now 37 years old, won Irish League titles with Cliftonville and Portadown and remains popular within the Shamrock Park fanbase.